PALO ALTO, Calif., Oct. 1, 2015 /PRNewswire/ -- Jive Software, Inc. (Nasdaq: JIVE), today announced an evolution of its interactive solution that combines the collaborative capabilities of the enterprise social network with its new suite of purpose-built mobile apps. By fully integrating Jive-w mobile apps, including Jive Chime, Jive Daily and Jive Circle with the industry-leading Jive-n internal solution, Jive liberates employees to work wherever and however they want through the power of a truly mobile, interactive intranet. Additionally, the latest release of Jive-n accelerates time-to-deployment with out-of-the-box, best-practice templates for HR, sales and corporate communications functions that deliver immediate value for all lines of business. "Jive is on a mission to help people work better together," said Elisa Steele, chief executive officer at Jive Software. "To remain competitive, companies are looking for connected, modern digital solutions with everything needed to get their jobs done. This next-generation intranet solution is tailored, managed and expanded with little or no burden on IT, which delivers immediate business value and clear ROI. It's totally mobile, with smart, elegant apps that keep everyone connected to their company and colleagues." The Interactive Intranet: Set-up in days, not weeks. Building on the thoughtful integration of Jive-w into Jive-n, the redesigned internal solution of Jive-n greatly streamlines set-up and administration while also outlining best practices for virtually every business function. Jive-n comes with out-of-the-box business accelerators that are pre-designed, ready-to-use sites and pages for departments, such as HR resources, sales enablement and IT help desk. In addition, the administration console is simplified for quicker access to the most essential functions at a glance. Better Together: The modern, interactive intranet with purpose-built apps. Jive-n offers the mobile freedom the standalone Jive-w mobile apps deliver with a rich app-ecosystem that supports a company's workforce and collaborative environment. Beautiful, engaging employee communication: Jive-n and Jive Daily combine to create a best-in-class employee communications solution. Within Jive-n, employees experience a completely redesigned news-landing page on a desktop and can seamlessly read the same content in the mobile newsreader app, Jive Daily, optimized for on-the-go workstyle. The fastest way to find and connect with colleagues: The integration between Jive Circle and Jive-n displays an employee's self-populated availability and location, dynamic org chart search capabilities via the Jive-n directory, and in the coming weeks, a meeting feature for coordinating schedules. Real-time team messaging directly from Jive-n, across devices: New "Click to Chime" and "Share with Chime" capabilities within the Jive-n profile seamlessly transfer employees to the Jive Chime desktop or mobile app for quick conversations and sharing of content. "The Timberwolves and Lynx are committed to providing our Pack members with the most innovative communication solutions to help foster our corporate culture and align and engage our employees," said Bob Stanke, senior director of digital at The Minnesota Timberwolves. "Jive continues to push the boundaries on what an intranet can look and feel like, and the integrations with Jive Chime and Jive Circle will further help streamline the way our employees connect with each other." 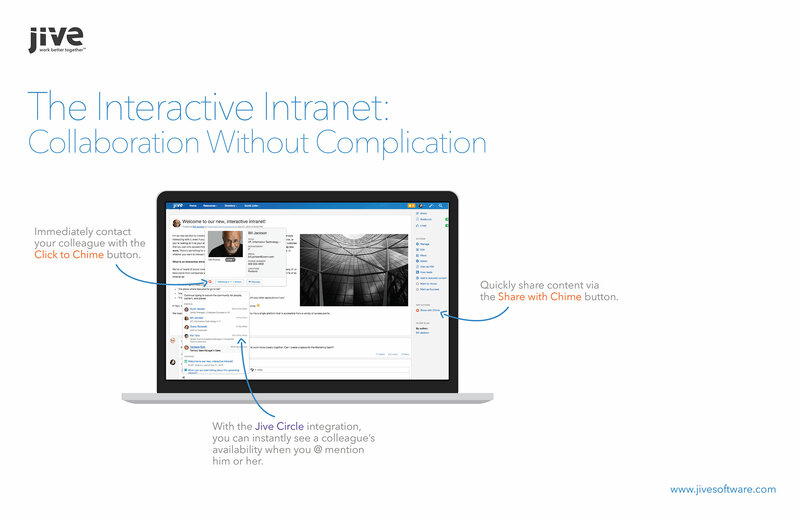 Third-party integration innovation for superior personal productivity: The Jive-n interactive intranet also delivers enhanced integrations with Google and Microsoft products, which further extends the collaborative hub experience and caters to productivity preferences regardless of service. Google integration streamlines collaboration across Jive-n: It is now easier than ever to seamlessly work across Google applications that are directly connected to Jive-n. New features for Google Drive™, Google Docs™, and Google Groups™ provide enhanced permission functionality while the Gmail™ integration update showcases profiles and related content, convert emails to discussions and upload documents directly into Jive. The new Jive connector for Hangouts™ communication platform also allows users to initiate video and chat sessions straight from Jive-n. Enhanced Microsoft SharePoint Online ® & Office 365™ integrations: Jive's newly established integration with SharePoint showcases the social context of Jive in SharePoint allowing employees to view feed activity, people information and engage with content.